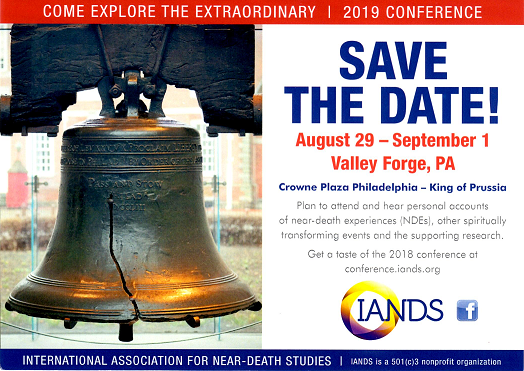 People who are terminally ill may have a near-death experience (NDE) just before the final phase of their illness, but the remarkable experiences that are more common as death approaches are called Nearing Death Awareness (Callanan & Kelley, 1992), or NDAs. Nearing death awareness is part of the dying process. The dying person may seem to look into the distance and talk with people who are not physically present, or may make friends and family members uncomfortable by talking about their plans for going on a trip. What they see and experience is often expressed by what appears to observers to be confused ramblings, incoherent statements, unusual behavior, or references with no personal context. They may use symbolic language to describe an inner experience or event. For instance, one woman insisted that she dress in her best clothes because her long-dead husband was coming to take her dancing; a young person claimed to need a map so he would know which way to go on his trip; people very often say that someone they loved but who has died is coming for them, or is in the room. These statements, once they are understood, show what the person needs in order to die peacefully. It is not uncommon for them to tell of the time of their death or to let go only after a certain event or condition takes place. The nearing death awareness experience can occur without the sudden shift in physical condition that usually precedes an NDE in an acute setting such as a heart attack, a near drowning, or a car accident. Meeting deceased relatives in nearing death awareness is almost universal, whereas in the acute setting this occurs only occasionally. The purpose of the NDAs in terminal illness seems to be to prepare a person for death; generally these NDAs are quite reassuring. The purpose of the NDE seems to be to teach the person how to live better. Like NDEs that occur in the acute situation, the terminally ill person may have a NDE when he or she is in a coma or an unresponsive state. However, some NDAs occur when the person is fully conscious. The person can stop conversing with a deceased relative and can immediately pay attention to what is happening in the room. Visitations differ from hallucinations, in that people experiencing hallucinations cannot suspend their hallucinatory reality momentarily to converse with people in their room. Living, absent relatives seem not to be perceived by the dying person. Sometimes a person may report being with someone who is believed by family or friends to be still alive, but who turns out to have died recently. If the dying are reassured that their experiences are perfectly normal for this stage of life, they can take great comfort from these encounters. As people approach death, they often participate in several tasks. They consciously review the life they have lived, often in great detail. Aspects that are of greatest interest to them involve relationships. Dying people look for themes in their lives, often for the first time. They want to identify what they have learned and what they have contributed. Sometimes they are surprised at what they find. Forgiveness emerges as a chief concern. Dying people often realize that forgiveness is an important aspect of completing unfinished business. They begin the process of saying good-by to all aspects of this life. They start to let go of things, one at a time. Categories of letting go include activities, signs of independence, roles they have played, and finally relationships. Things to consider when communicating with the dying. Be straightforward and honest, but let them lead the way. They may talk about going on a journey or going home as a metaphor for preparing to die. Be sensitive about how close they want you to sit to them, how much company they want, and how much talking is comfortable for them. People vary widely on this, and it is important to ask each one what is comfortable for him or her. People's skin seems to become more sensitive as they approach death. Even gentle stroking may be irritating at such times. Merely holding their hand gently may be the most comfortable. Understand that as they approach death, they may withdraw as part of the process of saying good-by to this life and all that it has meant. They may be unable to focus or absorb what is going on around them or with family members, and they may not want to visit as much with loved ones as they did before. It is important not to have your feelings hurt, but to understand that this may be a necessary part of their preparation for death. It seems that the dying often have the ability to choose the actual moment of dying and so it is not uncommon for people to die when their loved ones are out of the room, even for the briefest of times, to spare them. It appears as if some people who are dying find it easier to let go when they are alone. Not understanding this, families often feel unnecessarily guilty under such circumstances. Terminally ill people may remain close to death for a long period of time if they are waiting for a significant relative or friend to come to the bedside, in order to complete unfinished business with them before going into spirit. Many dying people like to have someone with them, but they may not wish to (or be able to) interact very much. Your quiet presence may be all that they want. Allow them to talk about their NDEs and their NDAs if they have occurred, but know that not every dying person shares such experiences. There are no studies yet that explain why some people have them and others don't. Please know that most dying people can be kept quite comfortable. If your loved one appears to be uncomfortable, please notify their health care provider. Know that this last stage of life often provides the most powerful interactions that loved ones will have in their entire lifetime. After the person has died, it is common for surviving loved ones to sense their presence. Some people may feel notified of the death by the person who has just died. The bereaved often feel the presence of their recently deceased loved ones who seem to be checking in on them. They may hear words, see their image, smell a familiar aroma such as a favorite shaving lotion, or merely sense their presence. Deceased loved ones may alert friends or family about some impending danger. Such contact with the deceased is quite usual. Final Gifts: Understanding the Special Awareness, Needs, and Communications of the Dying by Maggie Callanan and Patricia Kelley. New York: Poseidon Press, 1992. Grace in Dying: How We Are Transformed Spiritually As We Die by Kathleen Dowling Singh. San Francisco: Harper, 1996. Hello from Heaven: A New Field of Research Confirms that Life and Love are Eternal by Bill Guggenheim and Judy Guggenheim. Longwood, FL: The ADC Project, 1995. Love is the Link: A Hospice Doctor Shares Her Experiences with Near-Death and Dying by Pamela M. Kircher, MD. New York: Larson Publications, 1995. On Death and Dying by Elisabeth Kubler-Ross, MD. New York: Macmillan Publications, 1997. One Last Hug Before I Go: The Mystery and Meaning of Deathbed Visions by Carla Wills-Brandon, PH.D. Deerfield Beach, FL: Health Communications, 2000.